Today’s reality demands innovation and empathy for the customer from businesses. Customers are not only looking for the best service but also the best experience. Design Thinking addresses all pressing concerns and questions and divides insurmountable tasks into smaller doable tasks. Statistics and market research can give you certain insights, but spending time with the end-user, the insights become far more tangible. Failing fast and quickly through prototyping helps you eliminate weak areas. Design thinking breaks your preconceptions of what a good solution would be and unleashing new undiscovered possibilities. Leading you to a more desirable and human solution. TRANSITION FROM PMBOK 5th to 6th EDITION. PMBOK® Guide is a globally recognized standard for managing projects in today’s marketplace. In September 1991, the PMBOK® Guide was honored as a formal American National Standard by the American National Standards Institute (ANSI). As Project Management is evolving, to keep it relevant PMI revises PMBOK® Guide every 4-5 years. The sixth edition of PMBOK® Guide was released in September 2017. 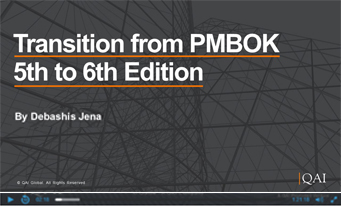 This webinar will introduce you to changes in PMBOK® Guide 6th edition and discuss them at a high level. It should help candidates currently preparing for PMP® exam to know what has changed, how to prepare and what additional to study. Both Design Thinking and Futures Thinking try to understand uncertainties, though with differing line of vision. Future studies are oriented to macro scale, that occur in advance of actual outcomes, where as Design Thinking is seen as developing products and services for today. Combining these two approaches and using common tools such as scenarios, trends analysis, mind maps and stories, the end point of design futures is to develop and implement futures scenarios from a designers’ point of view. Innovators in 21st century will be required to empathetically explore and apply understanding of human behavior, uncertainties, context, ecology, business realities and technology towards creation of digital products and services that enhance the users lives. Human-centered innovation and design in this case is not just “user-driven” in its traditional sense, but more about “designing for future usages and technologies” through a multi-disciplinary approach. 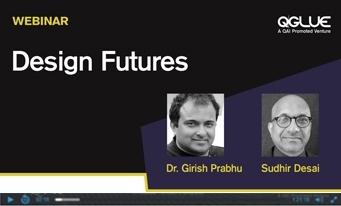 In this webinar, through a conversation between a design innovator and a futurist, investigate how Design Futures approach helps to innovate for the future. In the journey to deploy Design thinking one of the critical phases is the Develop phase which focuses on generating new ideas, sketching and storyboarding the same to test and validate the prototype. During the third stage of the Design Thinking process, designers are ready to start generating ideas. You’ve understood your users and their needs in the Empathize stage, and you’ve analyzed and synthesized your observations in the Define stage, and ended up with a human-centered problem statement. With this solid background yourself and your team members can start to ‘think outside the box’ to identify new solutions to the problem statement you’ve created, and you can start to look for alternative ways of viewing the problem. At this stage we must use newer ways to generate solutions which are future ready. Innovation TRIZ comes in handy here to address this need. 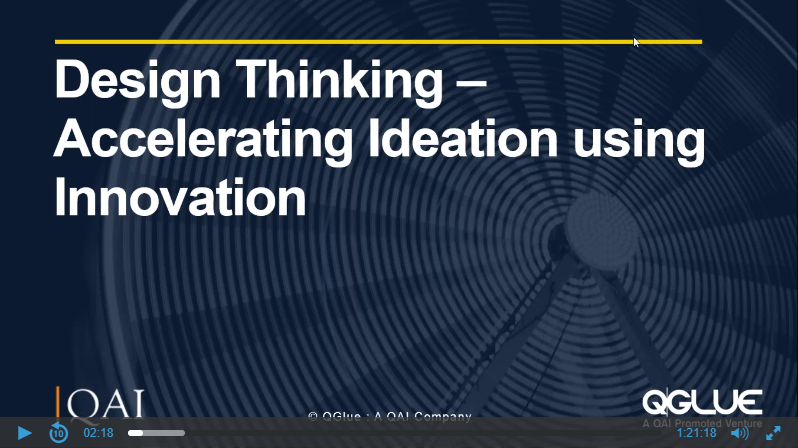 In this webinar we investigate how Design thinking – Ideation phase can be accelerated using Innovation TRIZ techniques. The Agile Manifesto states, “The most efficient and effective method of conveying information to and within a development team is face-to-face conversation.” SAFe takes this to the next level with PI Planning, a routine, face-to-face event, with a standard agenda that includes a presentation of business context and vision followed by team planning breakouts. Here, the teams create their iterations plans and objectives for the upcoming PI Facilitated by the Release Train Engineer (RTE), this event includes all members of the ART, whenever possible. It takes place over two days, and occurs within the Innovation and Planning (IP) Iteration. The result of planning is a commitment to an agreed set of Program PI objectives for the next PI. Holding the event during the IP iteration avoids affecting the timebox, scheduling, or capacity of other iterations in the PI. In this webinar, Jack highlights the primary activities and resources that an RTE uses to plan for the SAFe PI Planning sessions. Borrowing from their experience and lean software development methods, join Bob Galen and Shaun Bradshaw in this interactive and collaborative workshop as they examine essential patterns—the” thinking models” of mature agile teams—exploring how mature agile operate so that you can model them within your own teams. Along the way, you’ll examine patterns for large-scale emergent architecture, relentless refactoring, quality on all fronts, pervasive product owners, lean work queues, stretching above and beyond, providing total transparency, saying “No,” and many more. Bob and Shaun will also explore the leadership dilemma of self-directed teams and why there is still the need for active and vocal leadership in defending, motivating, and holding agile teams accountable. It is a realization, that in spite of innovation being an executive priority, there are flaws in managing it. The situation can significantly improve when innovation is systematically managed. In this path breaking webinar, Ripi highlights the way to inspire innovation for enterprise excellence. He further defines 5 levels of innovation robustness, and the 4 primary activities required to systematically progress the journey of innovation in your organization. Improving productivity through alignment of processes. Using live examples, and case studies, Rip will also demonstrate the value of this approach. This approach has evolved over years of successfully managing turnaround and startup R&D units, and association with successful business leaders, and Engineering and Business schools. Currently so much of agile adoption—coaching, advice, techniques, training and even the empathy revolve around the agile teams. Leaders are typically either ignored or marginalized at best, and in the worst cases often vilified. But Bob Galen contends that there is a central and important role for managers and effective leadership within agile environments. In this workshop, we’ll explore the patterns of mature agile managers and leaders. Those that understand Servant Leadership and how to effectively support, grow, coach, and empower their agile teams in ways that increase the teams’ performance, accountability, and engagement. We’ll explore training and standards for agile adoption, and situations and guidelines for when to trust the team and when to step in and provide guidance and direction. We’ll examine the leader’s role in agile at-scale and with distributed agile teams. Good leadership is a central ingredient to sustaining your agile adoption. Bad leadership can render it irrelevant or a failure. Here we’ll walk the path of the good, but also examine the bad patterns to inspire you and your teams. The age of customer calls for continuous testing. A Forrester study confirms that unprecedented speed of software delivery has made quality and speed a strategic pursuit for enterprises. While true integration with Dev and Ops brings immediate visible acceleration, quality engineering through continuous testing ensures the outcomes of DevOps results in market leadership. This phenomenon called DevTestOps is an option that leading global analysts and researchers are advocating for impeccable software that propels businesses as customers look for first time ready software. The concept of DevTestOps can imply either the merging of the Development, Testing, and Operations teams of an organization, or it could mean forming a middle layer of sorts that contains elements of both the teams. Whatever may be the case, DevTestOps is fast emerging to be the key to enterprise cloud. DevTestOps can be viewed as a potential solution to proving the benefits of cloud and improving the efficiency of IT operations, thereby accelerating the faster release of applications. DevTestOps is the mixture of practices, philosophies, culture, and tools that enhance an organization’s ability to deliver applications and services at significantly high velocity. This enables enterprises to serve their customers better and obtain a competitive advantage. The services spectrum in DevTestOps streamline management of the infrastructure, deployment of the app code, and automation of the release process. Software testing services help ensure that the various technology tools and solutions are adeptly adopted by enterprises and function robustly. In this topic, Pradeep Govindasamy, CTO & President at Cigniti Technologies, will be presenting the Quality Engineering scenarios across the DevTestOps IT lifecycle that includes BDD, Release Automation, Environment, Data, Virtualization, Build, and Continuous Integration/Continuous Delivery. Role definition of SDET (Software Developer Engineer in Test) in the DevOps IT lifecycle. Dr. Rico’s presentation on the “Business Value of Continuous Integration, Continuous Delivery, & DevOps: Scaling Up to Billion User Global Systems of Systems Using End-to-End Automation,” which are late-breaking 21st century approaches for rapidly and cost-effectively building high-quality global information systems, minimum viable products, minimum marketable features, service oriented architectures, web services, and microservices using containerization and end-to-end automation. As cyber threats evolve and as software dependencies grow more complex, understanding and managing software throughout the lifecycle is more critical than ever. The Internet of Things (IoT) is contributing to a massive proliferation of a variety of types of software-reliant, connected devices throughout critical infrastructure sectors. With IoT increasingly dependent upon third-party software, software composition analysis and other forms of testing are needed to determine ‘fitness for use’ and trustworthiness in terms of quality, security, safety, and licensing. Application weakness and vulnerability management should leverage automated means for detecting threat indicators, weaknesses, vulnerabilities, and exploits. Using standards-based automation enables the exchange of information. Leveraging cyber security Technical Risk Indicators as a measure of technical debt can assist in software supply chain risk management efforts by providing a means to understand risk exposures attributable to exploitable software. Organizations rely on third-party software that should be tested prior to use or integration within new software. Application weaknesses and vulnerabilities can be detected and mitigated in development and testing prior to use or integration in corporate assets. Technical Risk Indicators, derived from ITU-T CYBEX 1500-series standards, can be used by professions seeking to improve software quality and security. TESTING IN AN INTERNET OF THINGS’ WORLD! TECHNOLOGY MEGATRENDS AND QA: READY, SET, EVOLVE! The Scaled Agile Framework(SAFe) is a commercial industry systems and software engineering body of knowledge based on lean and agile values, principles, and practices. Lean and agile methods are now used by over 95% of public and private sector organizations worldwide. SAFe is a multi-level model consisting of best practices, guidelines, and tools for enterprise-wide portfolio management, value stream management (mission work flows, threads, and complex acquisitions), program management, and team-level project management. SAFe provides the program management and systems engineering discipline necessary to build complex, enterprise-wide mission and safety-critical systems, while retaining the flexibility, adaptability, and market-responsiveness of lean and agile principles. SAFe is emerging as the de facto standard for Global 500 firms, top U.S. financial institutions, major U.S. defense contractors, and public sector agencies such as the U.S. Department of Defense. • Understand and explain how SAFe 4.0 supports Lean & Agile principles. • Illustrate how and why SAFe 4.0 supports systems and software engineering. • Master the roles, responsibilities, and guidelines of its four major levels. • Learn how to apply SAFe 4.0 for portfolio, program, and project management. • Identify the business case, justification, and rationale for SAFE 4.0. • Internalize SAFe 4.0 principles by engaging in conversation and dialogue. GET YOUR AGILE TESTING UP TO SPEED! MAKE A DIFFERENCE AND USE TMMI. Ways organizations adopt TMMi as the framework to help them make a difference. HOW TO REALIZE BENEFITS FROM DATA MANAGEMENT MATURITY? Through examples of case studies, attendees will learn how the Data Management Maturity Model (DMM) has been used and what organizations have achieved, or can achieve, through it. WHY DO YOU NEED MATURITY IN DATA MANAGEMENT? Attendees will learn what data management maturity means, why it is necessary for their organization, and how they can generally determine where they may be along the continuum of data management maturity. Many organizations pursuing CMMI High Maturity face difficulty in developing appropriate business goals and quality and performance objectives that support CMMI High Maturity practices including QPM and OPP. This webinar discusses the mechanics of the approach to jumpstart a business goal and objective activity such that the resulting statements readily support the planning of statistical management and process performance modeling. Participants will readily see that merely copying and pasting business goals to serve as project level objectives is not sufficient for QPM and OPP needs. This third webinar discusses how one builds a roadmap for based on your organization’s attributes. These include your mix of work, your goals, size of your organization, and quality and availability of relevant data. The steps in building the solution involving Agile goal setting; current agility assessment; standardization of work product and state transition plan; Refactoring your organization to align with work products and building the integrated sense and respond loops. In this webinar, we focus on the need for an organization to graduate to the next level of maturity, and how this helps the organization achieve higher levels of performance and scale using CMMI both for development or services organization. PERFORMANCE IMPROVEMENT : MODELS, METHODS & TOOLS – HOW TO CHOOSE? Nobody cares how much you improve your processes; they care about how much your processes improve your business. 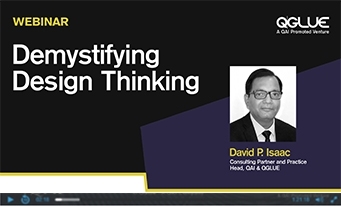 In this webinar, David explains how it is necessary to have good processes, and how to create them and what they might look like. It is critical to instrument the processes so that you can tell if they are beneficial.